Wrekin Products is a sponsor of the 2018 National Tree Officers Conference (NTOC). The Holmwood Park development of new homes in Ferndown, Dorset, has been created by Bellway Homes Ltd on a site surrounded by large green spaces including 1,000 acres of stunning parkland and forest. The aim of the new residential development was to create an estate that offers residents a perfect blend of town and countryside living. To ensure the environment of the development fits appropriately with the mature trees by which it is surrounded, the local planning authority specified that ten large canopy trees should be planted in hard landscaped areas at the entrance to the site to assist in the greening of the site. To achieve this a system was needed to enable the trees to grow and reach maturity without compromising the structural integrity of the hard-paved areas. Barrell Tree Care, the arboricultural consultant for the site, proposed the use of Wrekin’s TreeBunker Tree Root Development System to provide sufficient rooting volume for the trees and to maintain the structure of the pavements. Christchurch and East Dorset Council’s planning department also approved the system for use on the development. The TreeBunker system has been designed to ensure newly planted trees in hard landscaping are provided with increased rooting space to encourage continued growth and maintain their health. The system has also been developed with a high load capacity, allowing the product to be used in all vehicular loading situations. Big trees are desirable additions to developments as they have been proven to provide substantial environmental, social and economic benefits. Research has proven big trees can increase property values, reduce the heat island effect in towns and cities, reduce pollution and noise, provide the obvious habitat for wildlife and manage storm water run-off. Wrekin’s TreeBunker is a modular unit comprising of a base and top frame and 4 structural posts which are available from 400mm deep to 1.4m. The system is filled with uncompacted soil to encourage root growth through the large voids within the system. The system has been independently tested to achieve an axle load of 15 tonnes, ensuring that it is suitable for all European vehicular loadings. It is the most installer-friendly type of product on the market and is up to 30% more cost-effective to install against similar competitive products. 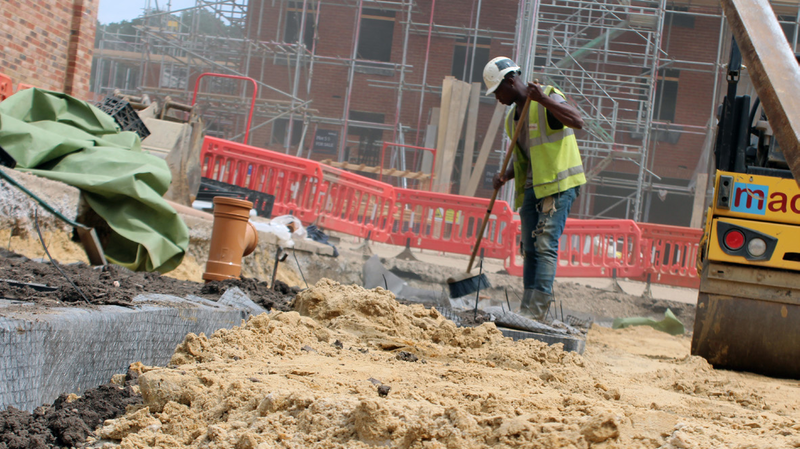 Wrekin supplied 384 units to the site which provided 10m3 of free soil volume to each tree. The ten trees were planted in two parallel trenches, each containing five trees. The planting of the trees in continuous trenches means that the roots can access each other’s soil space, increasing the overall volume the roots have access to. This 10m3 of soil means that the trees have a wonderful opportunity to reach maturity and provide the many benefits large canopy trees bring. 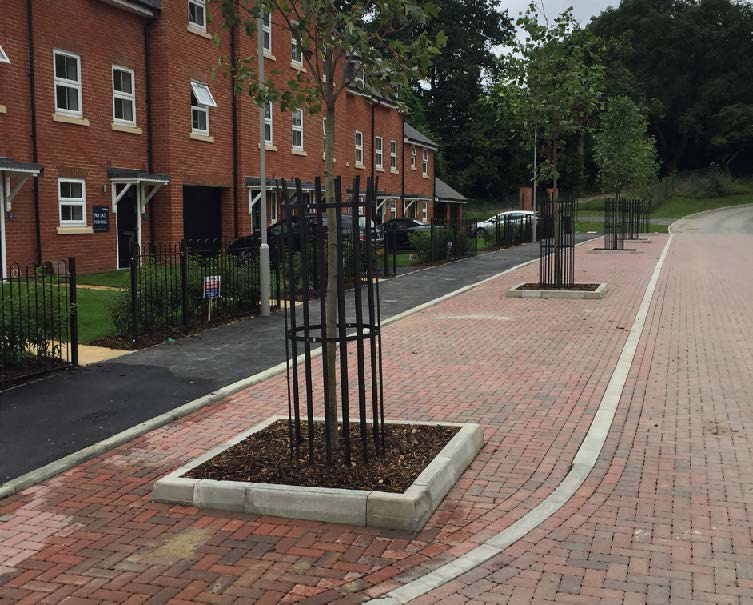 Both Bellway Homes and groundworkers Mackoy Ltd said they were extremely pleased with the simplicity of the installation process of the system, which was overseen by experts from Wrekin Products. Disclaimer: The views and opinions expressed in this article are those of Wrekin Products and do not necessarily reflect the views of the Institute of Chartered Foresters.